Developing the Far West presented a radically unfamiliar set of water challenges to the United States. While the continent as a whole had an abundance of water wealth, its best resources were concentrated in its temperate, river-rich, eastern half, where annual precipitation normally exceeded the minimum 20 annual inches necessary for sustaining small-scale, nonirrigated farming. Moving west from the Mississippi Valley into the semiarid, treeless grasslands of the high plains and prairies of western Kansas, Nebraska, and Texas—America’s steppes—rainfall tapered off and became more undependable. Beyond the 99th and 100th meridians, water, not free land, was the main limiting factor in development. Only in wet years did the Great Plains have enough rainfall to maintain cultivation. In 1865 the farming frontier ran roughly along eastern Kansas and Nebraska’s 96th meridian. Over the following quarter century successive waves of hardy, yeoman farmers tried settling in wet years across the 100th meridian, only to be pushed back by the dry periods that always ensued. Between 1870 and 1880 the population of Kansas, Nebraska, and Colorado increased by more than 1 million to 1.6 million. But by 1890, in the third year of a ten-year drought and after the terrible winter of 1885–1886, Kansas and Nebraska had depopulated by one-fourth to one-half. West of the Rockies most of the valleys and lowlands were deserts drier than North Africa; many were scarcely habitable regions with less than seven inches of annual rainfall, such as those of present-day Phoenix and Las Vegas. Western precipitation, including the winter mountain snows that melted into abundant spring runoff, was also highly seasonal and prone to prolonged cycles of drought. Thus even where freshwater existed in sufficient volume for farming, it was often unavailable when it was needed. Additionally, most of the Far West’s perennial surface water was confined within three large mountain-fed river systems—the Colorado in the Southwest, the Columbia in the Northwest, and the San Joaquin and Sacramento in California’s Central Valley—that were often long distances away over rugged terrain from most arable land. Water scarcity, in short, was the defining geographical condition of America’s Far West. As a result, the struggle for water was inseparable from the naked contest for power and wealth. Water rights were the stuff of family blood feuds, such as depicted in the 1958 Hollywood movie The Big Country. In the West, as author and humorist Mark Twain wryly put it, “Whiskey is for drinking. Water is for fightin’ over.” By pioneering the world’s first giant, multipurpose dams—the defining water innovation of the twentieth century—America from the mid-1930s successfully converted the West’s few wild rivers into dynamic engines of inexpensive irrigation, hydroelectricity, water storage, and flood control. The Far Western deserts were miraculously transformed into the richest irrigated farmland on the planet. The arid western hydrological frontier added potent new impetus to America’s rising civilization. Large cities rose in the desert. America’s federal government-led development became a standard feature of the national political economy. Very rapidly American dam technology diffused worldwide, spreading the prodigious material benefits deriving from the intensification of man’s basic uses of water. The Far West’s water challenge had more in common with the authoritarian, hydraulic societies of ancient Mesopotamia, although over rougher, harsher, and far more expansive landscapes than it did with the rainy, eastern United States, which had helped nurture America’s market democracy of independent, yeoman farmers, entrepreneurial industries, and decentralized political power. Indeed, incorporating the arid west into mainstream American civilization, posed political economic and cultural challenges within the purely technical one. These broader challenges were explored by America’s great turn-of-the-century historian, Frederick Jackson Turner, whose seminal 1893 essay “The Significance of the Frontier in American History” established the prevailing paradigm that America’s uniquely individualistic, democratic, pragmatic, and pluralistic character and institutions had been forged primarily by the frontier experience of continuous westward expansion, rather than by older theories of European values transplanted in the New World or the interplay of conflicting interests between the North and South. In his classic analysis of American history, Turner noted that the effective closure of the free land, farming frontier—which he considered to be virtually complete by 1893—had been accompanied by a gradual trend away from individualism and toward the social tendencies of cooperation, big business combination, and increasing reliance on government assistance. The physical challenges of Far Western settlement, he argued presciently, would inevitably accelerate that trend: “When the arid lands and the mineral resources of the Far West were reached, no conquest was possible by the old individual pioneer methods. Here expensive irrigation works must be constructed, cooperative activity was demanded in utilization of the water supply, capital beyond the reach of the small farmer was required. In short, the physiographic province itself decreed that the destiny of this new frontier should be social rather than individual.” Turner predicted hopefully that the frontier spirit of the yeoman farmer might endure by infusing itself in new democratic forms as America faced the historically centralizing, authoritarian tendencies of large states that organized control and distribution of irrigation river water in semiarid landscapes. By the time Turner delivered his landmark frontier thesis to the American Historical Association in Chicago, it was already apparent that private irrigation alone could not develop the Far West. Irrigation efforts in the region dated back to about 1200 BC, when indigenous southwest natives began digging irrigation canals to cultivate crops. By AD 500 the advanced Hohokam culture, northern neighbors of the Aztecs and Mayas, was well established with an extensive canal network around central Arizona’s Salt River, a tributary of the Colorado. Yet by the sixteenth century the Hohokams had vanished, likely victims of one of the prolonged natural droughts to which the region was prone or of ecosystem depletion caused by the soil salinization byproduct of intensive irrigation. Some of their canals were reexcavated and reopened in the late 1860s when U.S. settlers moved into the region. Modern western irrigation had begun with the Mormons, who migrated to Utah from 1847. Through centralized organization, religious discipline, and arduous work, the Mormons created numerous small, farm communities growing potatoes, beans, corn, and wheat by diverting small mountain streams into short canals. Between 1850 and 1890, they expanded their irrigated cropland fifteenfold to support a total population of over 200,000. Irrigated farming began in earnest in California after the gold rush with the coming of the transcontinental steam railroad in 1869. Speculative real estate consortiums organized communities of small farmers around water drawn through canals, sometimes with the help of privately built dams, from streams and rivers that flowed through California’s fertile Central Valley, including the King, the San Joaquin, the Kern, and the Sacramento. Eastern Colorado, settled from the 1870s by people inspired by utopian community ideals, was another pocket of western irrigated farming. As late as 1909, Colorado had more acres under irrigation than California. All in all, however, nineteenth-century American irrigators had done hardly much better than their Hohokam predecessors in transforming the Far Western landscape into an agricultural garden. By the mid-1880s, the best irrigation sites on most of the region’s small streams already were being tapped. If western farming was to be developed on a meaningful scale, bigger dams on the few large, wild rivers were needed. But enormous risk capital had to be pledged, and complex water rights issues settled, for such an undertaking. With the depredations of the late 1880s drought and the great economic depression of 1893, moreover, private financing all but dried up for large irrigation projects and land values fell. The final blow against private enterprise solutions was struck with the tragic collapse in the spring of 1889 of a privately built eastern dam in Johnstown, Pennsylvania, that unleashed a flood that killed 2,200. Throughout the 1890s, western private sector and elected leaders increasingly beseeched the federal government to take the lead. The groundwork for federal irrigation had been built over many years thanks to the pioneering efforts of John Wesley Powell. Born in 1834, Powell had explored the Mississippi River in the 1850s. Although he lost his lower right arm as a Union officer at the battle of Shiloh, he intrepidly led a blind expedition in 1869 of nine men on four wooden boats on the first ever explorative run of the wild Colorado River and the Grand Canyon. Parlaying his fame as an explorer into a national platform on western geography and development, Powell in 1874 shocked Congress and the nation in testimony that challenged cherished national myths: He declared that nearly the entire western region of the United States beyond the 99th or 100th meridian was too arid for small-scale, eastern-type agriculture without irrigation, and that even with irrigation the total available supply of water was sufficient to reclaim a much more limited amount of cropland for a much smaller population than irrigation boosters supposed. At the time, many public officials clutched to the comforting but fanciful notion that rain would follow the plow, permitting the unending advancement of small yeoman farmers across the continent. In 1878, Powell expounded his views in greater depth in his influential Report on the Arid Land of the Arid Region of the United States. This led to his appointment as head of a new government bureau to scientifically study western lands and later the irrigation potential of western water resources. In this capacity, Powell became a formidable champion of government-led water storage dams to irrigate America’s west. His view was that all the waters of every free flowing river should be commandeered from its natural bed in economic service to the nation. Public lands that naturally stored and accumulated water, such as mountain forests, should be conserved in government hands and not be sold to timber companies or other private interests that would deplete them. Powell did not fret that the United States might repeat the authoritarian history of the ancient hydraulic societies. Indeed, he advocated his own idealistic, technocratic program for development based on political units that would be reorganized around natural watersheds. Powell maintained that his plan would enable 1.25 million small farmers to cultivate 100 million acres of irrigable cropland. Powell’s idiosyncratic views, however, rankled vested establishment interests and disturbed the popular political myth that a federal irrigation program could be based upon a simple adaptation of Homestead-type grants of small, public lots to much-idealized, Jeffersonian yeoman farmers. At the second National Irrigation Congress in Los Angeles in 1893, Powell triggered an uproar by declaring, factually, that large private interests already controlled all the best irrigable lands in the West. But by then the irrigation movement had enough momentum from conventional politicians and powerful private interests to be able to divorce itself from the quirky, water wealth administration schemes of the original champion of the irrigation cause. A year later, Powell resigned from the government. In 1902, he died in obscurity in Maine. Under the 1902 Reclamation Act, money from the sale of public lands in the West was to fund federal irrigation works administered by a new Reclamation Service within the Department of Interior. Only family farms of 160 acres or smaller were supposed to benefit from the government’s irrigation largesse—a proviso that, in practice, would be routinely breached over the years. Roosevelt also appreciated the intimate interlinkages between water and forests. Forests served as natural reservoirs, conservers of soil, and restrainers of terrible floods. “The forest and water problems are perhaps the most vital internal questions of the United States,” Roosevelt stated. Near the end of his presidency, Roosevelt created the celebrated western public parks system, partly to conserve forest watersheds. Although the Reclamation Service (renamed the Bureau of Reclamation in 1923) eventually became world history’s largest government-run water technocracy—a modern democratic version of the ancient priestly elites of the Middle East and China’s professional mandarins—the irrigation program started ineffectually. In its first two decades its total projects covered so little acreage as to barely make a noticeable difference in the expansion of western agriculture. Its economic foundations also seemed dubious. Despite the generous water subsidy and extension of payment terms, over half of irrigation project farmers were defaulting on their water loan repayments by 1922. Wealthy land speculators tracked Reclamation engineers like buzzards, swooping in to buy up public homesteads wherever projects seemed likely in order to resell them later at greatly multiplied values to the new, and quickly overindebted, small farmers. Existing private landholders also enjoyed unearned bonanzas from the federal irrigation projects. Then in the early 1920s, the U.S. agricultural sector went into a depression with sharply falling farm prices, one of the contributing factors of the economy-wide Great Depression of the 1930s. Without the remarkable resilience of public bureaucracies to endure over time despite failure and loss of purpose, the Reclamation Bureau and the western irrigation program might well have vanished at that point as a forgettable footnote of one of history’s failed policy initiatives. What changed everything was the Hoover (aka Boulder) Dam. Reclamation engineers had dreamed about building a dam on the Colorado River ever since the bureaucracy’s inception. But it wasn’t until the late 1910s and 1920s that the combination of political, economic, and technological forces aligned favorably to impel the first serious steps toward undertaking the world’s first giant multipurpose dam on the lower Colorado. Another decade of political maneuvering would go by before construction could begin. The completed dam, which started full operations in 1936, was simply stupendous. It dwarfed all previous dams in history by orders of magnitude in scale and novelty. From ancient Roman and Han times through the nineteenth century few dams had surpassed 150 feet in height. The systematic application of the sciences of civil engineering, hydraulics, and fluid mechanics from the mid-nineteenth century, however, enabled the building of much more complex dam structures. The concrete Hoover Dam would stand 726 feet, over six times taller than the British-built marvel of the first Low Aswan Dam on the Nile even with its final 1929 extension, and more than twice as high as any other dam on Earth. It created the world’s largest man-made reservoir, the 110-mile-long Lake Mead, which could store two times the annual flow of the Colorado, or enough to flood the entire state of Pennsylvania under one foot of water. Its world’s largest hydroelectric power plant was capable of generating 1.7 million horsepower, upgraded to 2.7 million horsepower in the 1980s. By 2000, some 30 million southwesterners, almost 2 million acres of prized cropland, and metropolises such as Los Angeles, San Diego, Phoenix, and Las Vegas would be dependent upon the Colorado River’s water supply. Its wall contained enough concrete to build a highway across the continental United States. Hoover gave mankind, for the first time in history, the technical means for bringing the world’s mightiest rivers under almost total control, converting wild, variable currents and unpredictable flooding into tamed pools of carefully regulated flows and allocated levels. Vitally for American water technocrats, too, the Hoover Dam established a viable economic blueprint for dam projects they could emulate again and again to achieve their mission of transforming the arid West. In addition to its gigantic scale, the key innovation at Hoover was the dam’s successful multipurpose design. Throughout history, most dams and their affiliated waterworks had been built for a single purpose only—usually irrigation or flood control, but also improved navigation, drinking supply, or generating waterpower through waterwheels and, since the 1880s, hydroelectric turbines. Divergent purposes presented competing design challenges—for instance, flood control demanded low reservoir levels to catch flood swells while maximum power generation required full reservoirs; navigation presented still other difficulties. The multipurpose approach had been promoted as early as 1908 by Teddy Roosevelt in an effort to jump-start the flagging development of western irrigation. Despite the ingrained skepticism of the water bureaucracy establishment at the old Army Corps of Engineers, Reclamation officials, hungry to find their raison d’être, began to experiment with integrating hydropower to its irrigation dams. Their most celebrated early success was the elegant 280-foot-tall dam on the Salt River in Arizona. Completed in 1911 and named after President Roosevelt, the dam provided a visible boon to the economic life of the Phoenix area by both alleviating irrigation water shortages for farms built around the dredged-out canals of the long-gone Hohokam natives, and by generating electricity. Crucially, the electricity sales added enough revenue to pay for the dam. Hydroelectric sales underwriting farm irrigation subsidies: This became the working fiscal model for Hoover and the great dam era that it spawned. While American leaders had regularly rejected proposals throughout the 1920s to develop multipurpose dams on the Tennessee River in the eastern United States, since that would make the government a big player in the private electricity business, they were more amenable in the West, where the farming, urban, and railroad lobbying interests from Southern California made a concerted appeal for a giant irrigation, flood control, and hydroelectric dam on the great river that was the lifeblood of the southwest. Rising in the Rocky Mountains at 14,000 feet and falling toward sea level over its 1,440-mile length through deep canyons—including the Grand Canyon which its torrents had carved over the eons—and deserts, the muddy, turbulent Colorado River flowed within seven states to its delta in Mexico south of the California-Arizona border before exiting through its mouth at the Gulf of California. While its average flow of about 14 million acre-feet per year made it a relatively modest-sized river by volume—comparable in quantity to the eastern Susquehanna, Delaware, Hudson, or Connecticut and only a small fraction of the huge Mississippi and Columbia rivers—every drop was precious because it drained the most arid large basin on the continent. It was the only significant water source within 1,000 miles. For thousands of years its delta of lagoons and earthen mounds, twice the size of Rhode Island, had been a paradise for jaguars, coyote, beaver, a vast assortment of water fowl, fish, and uncountable species of plants. In its natural, predammed state the velocity of its flow was schizophrenic. When swollen with the springtime snowmelt from the mountains, it sometimes cascaded furiously down from the mountains at 300,000 cubic feet (nearly 2.3 million gallons) per second, tearing away mountainsides and smashing boulders; in the dry season it meandered by at less than 1 percent that speed. The river’s annual volume also varied widely, by over 50 percent, depending upon whether the region was in a wet or drought cycle. Most distinctive, its enormous, wild energy made the reddish-brown Colorado one of the siltiest rivers in the world. Sediment from the hillside during its steep descent accumulated in its lower reaches beyond the Grand Canyon, where the river was 17 times siltier than the muddy Mississippi. The river’s texture was playfully described by southwesterners as “too thick to drink, too thin to plow.” The riverbed was raised by the accumulating deposits year after year until, in a great swell, the river overtopped the sandy bluffs containing it. It flooded violently in new directions, carving fresh channels toward the sea. Before its taming by dams, the Colorado’s rampaging floods periodically turned the dry lowlands of Southern California and Mexico into huge swamps that left behind exceptionally fertile soil when the floodwaters evaporated. Just such a terrible flood event had been a midwife to the Hoover Dam. In the late 1890s, private developers had begun working on an ambitious scheme to clean out one of the Colorado’s ancient flood channels, known as the Alamo River, and use it as an irrigation canal to draw river water that would transform the low-lying, silt-enriched soils of the Southern California desert, with less than three inches of annual rainfall, into productive farmland. By 1901, the water started to flow. Its path started with a cut from the Colorado just north of the Mexican border, looped southward some 50 miles through Mexico, and then northward into a Southern California depression known as the Salton Sink. As some 2,000 farmers settled in, the irrigated lowland indeed bloomed forth with crops. Reflecting the new confidence and hope brought by the water, the area’s name was changed from the Valley of the Dead to Imperial Valley. By 1904, however, the natural accumulation of Colorado silt began to choke off the diversion channel. While working to dredge it, the irrigation engineers decided to draw river water temporarily from a newly cut bypass. Since it was supposed to be short-lived, the bypass was fitted only with filmsy, wooden control gates. As bad luck had it, the Colorado spring floods arrived two months early in 1905, and ferociously as well. The temporary control gates were washed out—and the full, raging force of the Colorado rushed into the ancient channel. The Salton Sink swelled with water, submerging thousands of acres of prime cropland to become today’s inland Salton Sea. Farmers appealed fruitlessly to Roosevelt for government assistance to close the breach. The powerful Southern Pacific railroad with a strong economic interest in the region, feverishly ferried in rock and gravel. But the breach remained open until 1907. Farming in the region revived slowly thereafter. But the shadow of the 1905–1907 floods galvanized a relentless lobbying campaign for a federal flood control dam on the Colorado. The Imperial Valley farmers also campaigned the government to build an accompanying, “all-American” irrigation canal that would run on the U.S. side of the border and thus eliminate Mexico’s potential leverage over the vital Colorado flow. By 1920, the political drive for the dam and canal had gathered enough momentum to be seriously proposed in Washington. When the fast-growing city of Los Angeles stepped forward in 1924 with a proposal to build, at its own expense, an aqueduct to tap Colorado River water and to buy hydroelectricity generated by the proposed dam in order to pump the water 200 miles to L.A. over a rugged escarpment, the economics of what came to be called the Boulder Canyon Project became feasible. Los Angeles desperately needed the water. A dusty, farming town of 13,000 at the edge of the desert at the end of the Civil War, Los Angeles owed its early growth to the region’s orange groves and the arrival of the railroads—a Southern Pacific spur line in 1867, and in 1885, a direct link to Kansas City on the Atchison, Topeka and Santa Fe. By 1905 its population had grown to 200,000 and was outstripping the available water supply of accumulated groundwater and flow from the small Los Angeles River—a creek for all but a few weeks of torrential precipitation in winter—whose annual flow was a mere one-fifth of 1 percent of California’s total. Los Angeles’s population might have crested around such modest levels had not city leaders pulled off one of the most notorious water supply grabs in history. In events that informed the story line of the 1974 film Chinatown, Los Angeles municipal water authorities ruthlessly gained command of the flow of the Owens River in one of the valleys formed by the old ice age folds in the Sierra Nevada 250 miles away. Between 1907 and 1913, they constructed an impressive aqueduct that brought Owens water to thirsty Los Angeles. L.A.’s water boss was the salty-tongued, autocratic William Mulholland, an Irish immigrant who had walked the railroad ties across the Panamanian isthmus en route to California as a young man. A self-taught engineer, he worked his way up from ditch cleaner to become the unchallenged potentate, builder, and personification of the modern Los Angeles water system. In the distant Owens River, Mulholland envisioned a water source, among the city’s very few viable options, that could provide L.A.’s hydraulic deliverance for a generation. He and his cronies stopped at nothing to get control of it, including deception, lies, secret agents, spying, and payoffs. With the clandestine collaboration of a paid insider at the federal Reclamation Bureau’s local office who was later hired as Mulholland’s deputy, and some astute politicking in Washington, they outflanked and killed Reclamation’s own farm irrigation plan for the Owens Valley. Posing as cattlemen and as resort developers, they bought farmland that gave Los Angeles the precious associated water rights to the river and gained control of the best site for the future storage reservoir. Adding insult to the injury of Owens Valley farmers, Mulholland rerouted their river water first to suburban Los Angeles’s dry San Fernando Valley, where a syndicate of well-connected city insiders, including railroad and trolley kingpins, utility bosses, newspaper barons, land developers, and bankers had been secretly buying up cheap land options. When the aqueduct route became known, San Fernando real estate values shot up, instantly turning millionaires into multimillionaires. San Fernando Valley soon was incorporated into Los Angeles, enriching the city’s fiscal base for growth. With the actual arrival of Owens River water in 1913, irrigated acreage in the San Fernando Valley blossomed twenty-five-fold in just five years. In the zero-sum economics of water diversion, Owens Valley withered so that San Fernando Valley could flourish. Before the dam project could get started, there was one further political hurdle to overcome—the sorting out of water rights on the Colorado River itself. Unlike the eastern United States, which followed the riparian legal tradition of granting water usage rights to landowners abutting a river or a stream, an alterative doctrine had developed in the water-scarce West. Known as “prior appropriation and use,” or more colloquially as “use it or lose it,” western water doctrine allocated priority water rights to the earliest and continuous users of a water source regardless of their location. In the early 1920s, when the dam project was taking shape, only California had any prospect of using large quantities of Colorado River water. But the other six states in the Colorado basin wanted to protect their rights for future use, lest California claim the entire river flow by using it before they did. As a result, Commerce Secretary Herbert Hoover, an engineer by training, brokered a landmark compromise among the basin states in 1922 that divided the river into an upper and lower basin and assigned equal shares of river water to each—a governance approach that oddly echoed John Wesley Powell’s original notion of reorganizing the West’s political units around its watersheds. 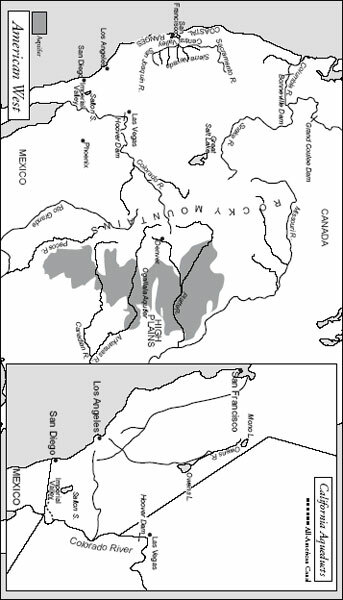 Working with the projection that the river had an average 17.5 million acre-feet per year to share—later proved to be a gross overestimate—some 7.5 million acre-feet were assigned to each basin, 1.5 million set aside for Mexico, and the rest reserved for natural evaporation or storage. The linchpin of the deal was California’s agreement to cap its withdrawals; the limit ultimately was set at 4.4 million acre-feet per year. It took over six years more to bring all the major elements, with required approvals, of the Boulder Canyon Project into final alignment. Finally, in 1929, newly elected president Herbert Hoover was able to launch work on the pathbreaking Boulder Dam that in 1947 would be renamed in his honor. In contrast to its long political gestation, the physical construction of the giant flood control, irrigation, and hydroelectric power-producing dam took only five years to complete. Despite its name, the dam was located not in Boulder, but in Black Canyon about 20 miles downstream and about 150 miles from the Grand Canyon. The misnomer arose from the original authorizing legislation before the final site was selected. There was no previous engineering model for building such a dam. Like many other pathbreaking civil-engineering feats in history, it was a leap into the unknown. Solutions were improvised to unforeseen problems as they arose in the finest spirit—and one of the last epic expressions—of Yankee ingenuity. No U.S. construction firm was large enough alone to tackle such an immense project, so a consortium of six builders banded together to make the winning bid—thus helping to launch the future destinies of Bechtel, Kaiser, Morrison Knudsen, and other global construction giants. The first stage, which began in 1931 and took nearly eighteen months to complete, was the blasting of four huge tunnels in the canyon walls through which the Colorado was diverted while the dam was built. With the river diverted and the work site secured by a temporary coffer dam, “high-scalers” suspended from long ropes blasted fresh rock from the canyon walls, while other workers excavated 40 feet down below the dry river until they reached the bedrock that would anchor the dam. Since the hot poured concrete filling the immensity of the dam’s volume would take a century to cool down naturally, engineers devised an instant refrigeration system by injecting frigid water through one-inch pipes that were inserted for that purpose at measured intervals throughout the structure; within two years, the cooling was accomplished. When no U.S. company could supply plate steel pipes large enough to funnel the falling water through the intake valves on Lake Mead to drive the turbines near the bottom of the dam, the builders constructed their own steel-fabricating plant on-site. Labor was nonstop around the clock. Work conditions in the searing heat were hard, and often deadly. When already low wages were cut in mid-1931, workers, organized by the IWW, or Wobblies, went on strike. But the Great Depression had started and the strike was broken, with the federal government’s tacit approval, by the importation of scab labor from nearby Las Vegas. By 1936 everything was done. Lake Mead began to fill behind the dam. Water began passing through the new turbine-generator units. The dam’s elegant, curved design, art deco flourishes, and 70-story-high grandeur topped off what was instantly recognized as a landmark achievement of civilization. “I came, I saw, and I was conquered,” President Franklin D. Roosevelt orated with a paraphrasing twist on Julius Caesar at the dam’s dedication in September 1935. Roosevelt, in fact, already had been won over by Hoover Dam as a model for the public works projects that became a signature centerpiece of his New Deal policy to counteract the Great Depression he’d inherited with the presidency in 1932. Across the country, construction crews were mobilized from the 25 percent unemployed and put to work building scores of new dams that harnessed the untapped water resources of America’s rivers. By the mid-1930s, the five largest structures on Earth, all dams, were under construction in the western United States—the Hoover on the Colorado, the Grand Coulee and the Bonneville on the Columbia, the Shasta on California’s Sacramento River, and the Fort Peck on the upper Missouri. Indeed, the Hoover Dam inaugurated a seminal turning point in water history—the age of giant, multipurpose dams. Over the three decades from the mid-1930s, America led the way in what became a worldwide frenzy of dam building that intensified production and transformed human society through the delivery of copious new supplies of cheap irrigation water and cheap hydroelectricity, as well as improved flood control and river navigation. By the 1940s, the United States had greater command of its water resources than any other nation. Its innovative leadership in converting the untapped boon of its river water wealth into productive economic and military output played a central role in its visible emergence as the global superpower in the aftermath of World War II. While the Hoover Dam and its New Deal–born successors did not provide enough stimulus alone to lift America from the staggering economic collapse of the Great Depression, the hope they inspired lent precious legitimacy to a government beleaguered by faltering faith in the efficacy of the country’s bedrock political economic system. One lasting impact of the giant, state-built dams everywhere was to help usher in an era of enlarged political and economic centralization with many similar characteristics, albeit in modified forms, to the irrigation-based river states of antiquity—strong government involvement in the economy, policies implemented by a cadre of technocratic engineering overseers and a large workforce of low wage laborers. Control and mass manipulation of river water likewise was a key element of political power, with the chief beneficiaries of the waterworks’ wealth, as in ancient societies, both reflective and reinforcing of the society’s established power structures—in this case, featuring disproportionate subsidies for politically overrepresented agricultural businesses. Under the New Deal, all the major river basins of America’s Far West came under intensive, multipurpose dam development. Thanks to the exploitation of water, the Far West became the country’ most dynamic growth region in the postwar era, exceeding Teddy Roosevelt’s vision for it at the turn of the century. No river in the West was mightier than the Columbia in the Pacific Northwest. It carried nearly 10 times more water than the Colorado and roared out of the glacier-covered mountains and through wide canyons with torrential seasonal force. Its vast potential—especially for hydropower—had long tantalized engineers. Fully exploited, the river could generate enough hydroelectricity for the entire population living west of the Mississippi at the time. One site in particular held colossal potential—the Grand Coulee (“Great Canyon”), a 50-mile-long canyon one to six miles wide within 500- to 600-foot cliffs that were structurally ideal for building a dam. Yet until the early 1930s the river was completely untamed. Newly elected president Franklin Roosevelt was personally determined to change that. When Congress balked at the extraordinary cost of erecting a high dam at the remote Grand Coulee that would provide far more hydropower and irrigation water than anyone imagined could be profitably used by the 3 million inhabitants of the region, Roosevelt started the project on his own from other relief funds. In the end 36 huge dams would be built on the Columbia and its tributaries between 1933 and 1973—nearly a dam per year. The multipurpose Bonneville in 1938 and Grand Coulee in 1941 were world-class supergiants of their era. Thousands were put to work building them. To help win the public relations battle over the utility of the dam, Roosevelt’s staff hired folk balladeer Woody Guthrie as a research assistant. In his folksy midwestern twang, Guthrie communicated the inspiring grandeur of the dam project, in songs like “Roll on, Columbia,” as the mightiest object ever built by man. When finished, the Grand Coulee Dam was indeed the mightiest thing ever built: four-fifths of a mile wide, 550 feet tall, three times the mass of the Hoover Dam, generating half as much hydroelectricity as the entire country at the time, and capable of irrigating over a million acres. The giant concrete plug in the great canyon backed up the artificial Franklin D. Roosevelt Lake some 150 miles to the Canadian border. Downriver, the Bonneville was already generating electricity and taming the wild five-mile rapids with big locks that enabled the passage upriver of large barges transporting farm produce and bauxite to the aluminum smelting industry that developed around the region’s rapidly expanding availability of electrical power. By the late 1980s, the Columbia River was providing 40 percent of America’s total hydroelectricity. Like Hoover and the other multipurpose giants of the era, Coulee’s hydroelectric sales heavily subsidized the building of the dam and associated irrigation project costs. Yet in the late 1930s, carping critics of Roosevelt were still wondering loudly who would buy so much excess electricity. History, however, repeatedly demonstrated that the development of a useful resource inevitably found unimagined and unforeseen productive applications. Yet no one could have anticipated just how swiftly the great need for the northwest’s surplus electricity would arrive. Only five days before the completion of the dam, Japan attacked the American fleet at Pearl Harbor. The United States entered World War II. The war’s extraordinary mobilization and economic stimulus caused airplane factories and aluminum smelters to spring up throughout the region. By 1942, 92 percent of Grand Coulee’s and Bonneville’s electricity output was powering war production. Most of it went to producing thousands of warplanes bound for the aircraft carriers that turned the war in the Pacific in America’s favor. An aerospace industry vital to the war effort also arose in Southern California on the electricity available from the Hoover Dam. Japan and Germany had nothing to match it. It was no exaggeration to say that America’s superior industrial productive capacity in general—and its vastly superior and timely availability of hydroelectric power in particular—played a decisive role in the nation’s rapid rebound from Pearl Harbor and its ultimate victory in the war. Indeed, rarely in history had exploitation of a water resource so dramatically and immediately affected the military outcome and the rise of a great power. During the war, Coulee’s electricity also powered the top-secret Hanford military installation on the Columbia in Washington State to help produce the plutonium-239 that made the United States the preeminent nuclear superpower of the postwar era. Less than three months after his dedication of the Hoover Dam, Roosevelt signed off on another immense water-moving and irrigation project for the West’s third great river basin that ran through California’s 450-mile-long, 50-mile-wide Central Valley. Its scale dwarfed the volume of water that Hoover Dam was delivering to the Imperial Valley in Southern California. Set in the basin of the San Joaquin and Sacramento rivers between the Sierra Nevada and Coastal mountain ranges, the Central Valley Project transferred water from California’s wetter north to its arid south. In the process it transformed a region as dry as North Africa into America’s produce capital and the richest concentration of irrigated farmland in the world. A small boom of private irrigation in the Valley had occurred around World War I when large farmers began to use motorized, centrifugal pumps powered by oil or electricity to tap deeply into the region’s store of groundwater. Through the 1920s, some 23,500 well pipes pumped up prodigious amounts to be able to luxuriously irrigate the San Joaquin Valley in the southern Central Valley, and helped California surpass Iowa as the nation’s leading agricultural state. But by the early 1930s the uncontrolled groundwater pumping had caused the water levels in its large aquifer to plunge so drastically that thousands of acres had to be retired for want of irrigation water. As the aquifer emptied and drought conditions prevailed on the surface, the big farmers of the Central Valley turned reluctantly to the government for relief. The federal waterworks were followed in the early 1960s by another gigantic, entirely state-built California Water Project that moved water even more ambitiously through a network of dams, reservoirs, and hundreds of miles of aqueducts—featuring a section that pumped water, with an extravagant expenditure of energy, over an entire mountain range in five stages, including a final, Herculean two-fifths of a mile lift. By the time the water started flowing over the mountains in 1971, California was by far the most intensively water-engineered place on the planet. Every big river flowing from the Sierra Nevada was dammed. New Deal western waterworks also had their counterparts in the nation’s eastern half. Most celebrated was the Tennessee Valley Authority. Launched in 1933, the TVA attempted nothing less than the comprehensive management of the entire Tennessee River basin, three quarters the area of England, with the declared purpose of raising the economic and social well-being of its downtrodden inhabitants. The TVA’s sweeping powers were governed by an independent public body whose precedent was the special authority granted to the Panama Canal Commission. Throughout the 1920s progressives in Congress had stymied presidential plans to privatize the government’s big dam at Muscle Shoals, its nitrate factory for munitions, and other assets on the Tennessee River through sale or lease to big businessmen such as Henry Ford. Through the TVA, those assets were converted by the New Deal into the centerpiece of an ambitious, state-managed effort to produce electricity, flood control, irrigation water, improved navigation, and even nitrate and phosphate fertilizers for the region’s farmers. No other river in the world had so concentrated an amount of its volume dammed in a staircase of 42 dams and reservoirs, although the 700 miles in the middle reaches of the Missouri River was a close runner-up. The results transformed the Tennessee Valley: rampant spring flooding ceased to afflict Tennessee farmland; improved navigation facilitated freight transport on the river to multiply sixty-seven-fold to 2.2 billion ton-miles in the thirty years leading up to 1963; electricity prices fell by more than half; farm yields multiplied on government-produced fertilizer; endemic malaria was eliminated; even the health of the river valley ecosystem was enhanced by the public reforestation of over a million acres. Tennessee River electricity also powered aluminum and war production factories for World War II, including the Oak Ridge atomic fission center, and brought farmers the first, wondrous benefits of electricity. In the early 1930s, American farmers had been left behind on the dark, Have-Not side of America’s electricity divide. Only 10 percent of farms were electrified. By 1950, thanks chiefly to hydropower, 90 percent of U.S. farmers had access to illumination, refrigeration, radio, and the other productive, modern benefits of electricity. Hundreds of huge dams were erected across the country during the apogee of America’s giant dam-building age in the early postwar era. Through all U.S. history some 75,000 dams had been built—about one per dayfrom the end of George Washington’s presidency to the inauguration of George W. Bush over 200 years later. Most of the 6,600 large ones over 50 feet, and all the multipurpose giants, were built after Hoover. For its seventy-fifth anniversary, the Bureau of Reclamation cataloged its cumulative bureaucratic accomplishments: 345 dams, 322 storage reservoirs, 49 power plants marketing over 50 billion kilowatt-hours, 174 water-pumping plants, 15,000 miles of canals, 930 miles of pipelines, 218 miles of tunnels, more than 15,000 miles of drains, irrigation water for 9.1 million acres, and freshwater for 16 million urban and industrial users. Farming in the arid Far West had not merely been born, but flourished as one of world history’s all-time irrigated agricultural gardens. By 1978 the 17 western states had 45.4 million acres under irrigation—10 percent of the world’s total. From the 1940s America was by far the most advanced hydraulic engineering civilization on Earth. As in past eras of history, this leadership was reflected in both robust population growth and an even greater surge of available freshwater supply. American water use for all purposes multiplied tenfold, from 40 billion gallons per day to 393 billion gallons between 1900 and 1975. Population tripled in the same period. The more than tripling of freshwater use per person was a leading indicator and driving factor behind the country’s rapid rise in living standards, national economic productivity, and preeminent global influence. America’s intensive proficiency in every traditional category of man’s use of water, and its pioneering leadership in leveraging innovative water breakthroughs was a major reason why it was the best fed, healthiest, first fully electrified, most industrially productive, most urbanized, most transportation efficient, and most militarily powerful nation on Earth in the postwar decades. Not all the upsurge in America’s freshwater supply in the Far West derived from its innovative dams. From the mid–1940s, the drought-prone western High Plains was transformed from a hellish Dust Bowl into an irrigated cornucopia of grains by a sudden abundance of water drawn from an altogether different source—an immense, heretofore mostly inaccessible, aquifer that lay buried, like a sealed subbasement, deep beneath the near surface groundwater table underlying its semiarid landscape. Ogallala, or High Plains, water accounted for about one-fifth of total U.S. irrigated farming by the late 1970s, and in good years, up to three-quarters of the entire world’s wheat crop that was sold on international markets. In addition, 40 percent of American cattle drank Ogallala water and ate Ogallala-watered grain—every ton of which required some 1,000 tons of water to grow. The hydraulic secret of the arid High Plains was that running far underneath Nebraska, western Kansas, Oklahoma’s Panhandle, northwestern Texas, and small portions of South Dakota, Wyoming, Colorado, and New Mexico was a giant honeycomb of up to half a dozen enclosed pockets of freshwater that together were the size of Lake Huron, and contained some 3.3 billion acre-feet, or over 235 years’ flow of the Colorado River. The water was wedged between rocks and mixed with silt, sand, and stones. The deepest portion of the aquifer was in the north, so that overall about two-thirds of the water lay under Nebraska and 10 percent each in Texas and Kansas. Ogallala’s “fossil water” was the drop-by-drop accumulation from prehistoric ice ages—one of the largest known subterranean reservoirs that existed deep inside the planet’s bowels at varying depths. Around the planet there was up to 100 times more freshwater locked away in aquifers than flowed freely and readily accessibly on the surface. Such fossil aquifers existed like nonrenewable, stand-alone reservoirs insulated from the planet’s continuous, natural hydrological recycling of surface and shallow groundwater through evaporation and precipitation. They recharged so slowly—Ogallala only half an inch per year from the trickle down from the surface—that they effectively could be used only once before depleting like an empty gas tank. Due to water’s great weight and the technological and cost limitations of pumping up water from aquifers, the High Plains’s underground water wealth remained virtually untapped through the 1930s. Waterwheel-powered pumps were useless in an arid land without running streams to drive them, while the cost of transporting coal for steam pumps was prohibitive. Windmills could lift only a few gallons per minute and thus barely skimmed the surface of the Ogallala’s deep reserves. The ranchers’ prairie-grass-grazing cattle herds of the 1870s and 1880s had disappeared in the droughts and heat of the 1890s; with the return of the rains and demand for grain after World War I, farmers again ventured forth with their plow mules into the water-fragile frontiers beyond the 100th meridian. Then during the prolonged drought years of the 1930s came the man-assisted environmental catastrophe of the Dust Bowl. By clearing their land through cattle grazing and burning harvested wheat stubble, farmers inadvertently turned a fragile ecosystem into an unstable one. Without vegetation to hold the loose topsoil in place, the return of drought, heat, and high, gusting winds kicked up horrific dust storms that devastated farming across the western plains. Dust storms were created when dry soil was lifted into the air by hot, high, winds; the resulting cloud of swirling, fine particulates grew larger and larger and gathered force as it swept across the open prairies. Eventually it became a gigantic cloud of stinging, shearing dust up to 10,000 feet high and reaching velocities of 60 to 100 miles per hour. The devastation wreaked by the dust storms was of biblical proportions: crops torn up and entire harvests lost, houses shorn of their paint and chickens of their feathers, dirt clogging mechanical farm equipment and water pipes, and millions of tons of fertile topsoil—the precious patrimony of the land—blown far away forever. In the duster that started on May 9, 1934, some 350 million tons disappeared, darkening the skies and dropping dirt residue over Chicago, Buffalo, Washington, D.C., Savannah, and even ships sailing 300 miles into the Atlantic. Between 1935 and 1938 there were an average of more than 60 major, sky-blackening dust storms each year. In the heart of the Dust Bowl—a 400-mile-long by 300-mile-wide area encompassing parts of Oklahoma, Texas, New Mexico, Kansas, and eastern Colorado—the average acre was stripped of 408 tons of fertile topsoil, leaving behind pauperized, sandy earth. Some 3.5 million “Dust Bowl refugees” abandoned the Midwest in search of work by 1940. Many migrated west to pick crops in California, enduring the hardships chronicled in John Steinbeck’s classic novel The Grapes of Wrath. Even as the dust storms blew, the High Plains farmers’ deliverance was at hand in the form of the centrifugal pump already being used with miraculously transformative effects in California’s Central Valley to extract voluminous amounts from its own aquifer. With the postwar recovery and the availability of cheap diesel fuel from the nearby oil patch in Texas and Oklahoma, diesel-powered centrifugal pumps and water wells proliferated. A centrifugal pump could lift 800 gallons of water in only a minute, making widespread irrigation possible on the High Plains for the first time. Oil drilling techniques were also adapted that could raise water even faster. With the postwar invention of the center-pivot irrigation system—a long-tentacled, mobile sprinkler system hooked up to a water well—water pumping and irrigated farming boomed. With some 150,000 pumps extracting huge volumes day and night during the growing seasons, Ogallala annual water use quadrupled between 1950 and 1980, and irrigated acreage septupled to 14 million acres. By the late 1970s, intensified by modern petrochemical fertilizers, pesticides, herbicides, and generous farm subsidies, the 1 percent of American farmers working 6 percent of the nation’s cropland that forty years earlier had been a desolate Dust Bowl, were growing 15 percent of that nation’s wheat, corn, cotton, and sorghum. But the boom couldn’t last indefinitely. Farmers were drawing water out of the Ogallala 10 times faster than the aquifer network was recharging. Irrigation farmers were living on borrowed time and water. The most profligate drilling was in west Texas and other southern portions of the aquifer. One Kansas region that in 1970 thought it had reserves for 300 years discovered in 1980 that it had only a seventy-year supply left. Water that had accumulated over so many millennia, and acted like an emergency reserve of nature, would be consumed in a one-time irrigation bonanza lasting no more than a century unless it was conserved or used more productively. The prairie would revert to its natural, hardscrabble aridity, its agricultural bounty wither in a new cloud of dust. Drawing America’s groundwater patrimony for unsustainable food exports to foreign countries was a particularly shortsighted policy. From the late 1970s, drawdown allocation agreements and sharply increased pumping costs due to the era’s oil price shocks, slowed the rate of depletion and encouraged irrigation efficiencies that got “more crop per drop.” Yet the overdrafts—which by 2000 totaled 200 million acre-feet, or 14 Colorado Rivers—were highly concentrated in a few shallower, southern regions. Thus while sustainable equilibrium was being achieved in water-rich Nebraska, Texas and Kansas had already used up some 30 percent and one-sixth of their total shares, respectively, and were still overdrawing at a reckless pace. The looming storm cloud gathering over parts of the prairie was the question how long accessible water from the Ogallala reservoir would last. The day of reckoning for Texas and Kansas was expected to hit between 2020 and 2030. Recognizing that the future of oil-built Texas depended upon securing enough freshwater, some Texan leaders schemed, and failed, in the late 1960s to steal a march on their regional neighbors by launching an outsized, technically complex, and extremely costly interstate Texas Water Plan to transfer flow from the Mississippi River and pump it across the state to the high plains of west Texas. Robbing one heavily used water ecosystem to replenish another offered no fundamental fix to the depletion challenge. But it did provide a foretaste of the extreme kind of political and resource competition that lay ahead as parts of the Ogallala ran dry. From the San Joaquin Valley in California’s Central Valley and metropolitan Phoenix to El Paso and Houston, Texas, water tables in many arid regions were falling precipitously, causing land subsidence and salt contamination of drinking water and farmland. Despite the respite from California’s great water-moving projects, unregulated overpumping in the Central Valley had resumed at such a furious pace that the groundwater tables had plunged up to 400 feet and the land itself had fallen 50 feet in some places. Even the rivers, lakes, wetlands, shallow groundwater, and interrelated water ecosystems of the country’s rainy, eastern half were also under growing stress from the intense demands of population and industrial growth. In south central Florida, the straightening, damming, and redirection of streams to benefit the region’s large sugar growers had disrupted the fragile Everglades wetlands, which were drying up and shrinking. As clean, fresh surface water became less available across America, groundwater resources were being overdrawn to make up the shortfall. In the thirty years leading up to 1996, total U.S. groundwater usage more than doubled to account for one-fourth of all U.S. water usage. Although America was one of the world’s most water-rich countries, with 8 percent of the world’s replenishable freshwater but only 4 percent of its population, shortages of fresh, clean water were starting to impinge upon many regions’ patterns of growth, fomenting a new politics of resource competition among neighbors used to plenty. It wasn’t that the country didn’t have enough total water to meet its needs. Rather it was that its profligate use was finally exhausting the productive limits created by the innovative successes of its age of giant dams. The era of cheap, plentiful water was closing. New technologies and more efficient usage were needed. As throughout water history, the success of one era was seeding the defining challenge of the next. America’s age of great dams drew to a close during the 1970s. By then, virtually all the best large dam sites had been exploited. Hardly a major river flowed freely across America’s landscape without being interdicted by dams and stored behind reservoirs. While the earliest dams from Hoover onward had returned the largest economic gains for the lowest subsidies, the later ones, by and large, had been built at the more marginal sites, carried the largest subsidies, and had hardly provided any net economic benefit at all. Yet even as the dam-building boom tapered off, demand for more freshwater and hydropower continued to escalate to meet growing populations, intensifying the political struggle among users to control a greater share of the limited, indispensable liquid resource. The Colorado River told the tale. By 1964 an array of 19 large dams and reservoirs held four times the river’s annual flow and gave man total management over the Colorado system. No longer did the river remotely resemble the wildly surging, unpredictably flooding river explored by John Wesley Powell almost a century earlier. Each drop was measured, every release calculated, and every event on the river planned by its central managers. It was the lifeblood of the entire southwestern United States. Every drop was used and reused 17 times before reaching the sea. As demand for its water increased, it also became the most litigated river in the world. By the 1950s Southern California was not only consuming its full 4.4 million acre-feet entitlement under the 1922 water sharing compact, but also was starting to take up to an additional 900,000 acre-feet of unused flow allotted to other states. A Supreme Court ruling in 1963 instigated by fast-growing Arizona, which feared California would claim a permanent right to the water that was otherwise part of its allocation, put a legal hold on California’s water overuse—although the political showdown to make it practicable did not occur for another forty years. As the water needs of Arizona and other basin states increased toward their full allocations, something had to give. The first to feel the squeeze was Mexico. During the 1950s an average annual 4.24 million acre-feet had flowed across the border into Mexico, which used it for irrigation and to replenish the lagoons of the river’s lush delta. In the 1960s, the average flow plummeted to the 1.5 million acre-feet minimum entitlement under the 1944 treaty, and the river rarely again reached the sea. Deprived of water and silt, the delta ecosystem shrank into an almost lifeless, salt flat wasteland with a few strips of irrigated cropland. Worse still for Mexico, its 1.5 million acre-feet had become so briny as to be almost worthless for irrigation. The transformation of the Colorado by damming and intensive irrigation had also changed the river’s composition as well as its volume. Sediment trapped behind the dams made the river much less silty. Irrigators could partly compensate for the loss of naturally refreshing silt flood deposits by intensive use of artificial fertilizers. But the drainage backflow of used irrigation water contaminated the river with high levels of salts leached from the cropland; by 1972, salinity at the river’s halfway point had increased two and a half times over its natural, predam state. Salinity accumulations were highest downriver at the Mexican border. For more than a decade, the United States had rejected Mexico’s protests that the 1944 treaty guaranteed it 1.5 million acre-feet of irrigation-quality water. Then, in 1973, perhaps mindful of the discovery of large oil fields in offshore Mexico, American diplomats finally agreed to deliver water with an acceptable salt content. While competition for Colorado water intensified, the river’s managers also made the awful discovery that the 1922 Colorado River Compact’s baseline estimate of 17.5 million acre-feet per year had been much, much too optimistic. The eighteen-year streamflow data on which it had been measured covered an unusually wet period; by 1965 the Bureau of Reclamation knew that longer-term data suggested an average flow of only about 14 million acre-feet. Subtracting Mexico’s 1.5 million and another 1.5 million for evaporation from the giant man-made storage lakes left only 11 million to be divided among states whose irrigation, hydroelectricity, and urban drinking water projects, when built to full capacity, depended upon receiving all the anticipated 15 million acre-feet. The government-brokered compact simply promised more water than it could deliver. The reckoning day for the Colorado water shortage was postponed by an extremely wet decade from the late 1970s and by reservoir draw-downs from Lake Mead and other storage facilities on the river. The full impact of overallocation finally began to be felt with the long drought in the first decade of the twenty-first century. The river’s flow at the Compact’s official delivery point from upper to lower basin states at Lee Ferry, Arizona, sank to its lowest level since measurements began in 1922. As Lake Mead, with its 28 million acre-feet capacity, drained to less than half full, water managers scrambled to develop emergency plans in the event it continued to sink below the level of Hoover’s intake pipes. A growing body of long-term climate evidence from tree rings, moreover, suggested that the 1900s might have been a relatively moist century. A return to normal climate patterns thus would likely make the southwest even hotter and drier; another megadrought, like the speculated one that may have obliterated native farming civilizations early in the last millennium, was a possibility. Whether man-made or natural, the warmer weather in the Far West over the thirty years to the mid-2000s was already discernibly diminishing Colorado water flows by reducing the winter mountain snowpacks and the replenishing spring runoff it brought when it melted, while also increasing the evaporation loss from reservoirs. The prospect of chronic Colorado River water shortages menaced the basin’s 30 million with economic slowdown, possible chronic water crises in large desert cities like Las Vegas and Phoenix, and chaotic political clashes for water among compact states and among metropolitan, industrial, and farm users within them. The Colorado River shortages signified the dawning of a new Far Western water era marked by supply limitations and ecosystem depletions that demanded fresh responses including alternative technologies, conservation, organizational redeployment of scarce water resources, and new approaches to water management. One of the largest problematic legacies of successful irrigation of the arid west was the extreme economic misallocation caused by the lavish government subsidy for large farm businesses, which consumed over two thirds of the river water and whose runoff by far caused the greatest damage to underlying ecosystems. Such subsidies had served their original purpose in fostering western agricultural development, but long ago had outlived their usefulness. In California, four of every five farms were over 1,000 acres and 75 percent of the state’s entire agricultural output came from just 10 percent of the farms. By the late twentieth century, vested agribusinesses had become privileged Water Haves who paid almost nothing for the region’s scarce water, while more economically productive and water-efficient industries and cities were taxed by having to pay burdensome premiums of up to 15 to 20 times more to obtain enough. The efficient allocation mechanism of competitive market forces was being grossly distorted, with perverse impacts on economic growth, environmental resources, and basic fairness. The end of the age of great dams in the United States occurred in the 1970s when an alliance of environmentalist, urban, and recreation industry lobbyists, armed with arguments proving the uneconomic returns of new large dams, united to gradually offset the overrepresentation of irrigation and dam interests in state and federal politics. The breakthrough event came in the late 1960s when the Sierra Club, founded in 1892 by naturalist John Muir and other Californians, rallied a national political effort to defeat proposals to dam the nationally hallowed natural wonder of the Grand Canyon. From then on, the national debate turned increasingly to offsetting the deleterious environmental by-products of dams, such as the drying up of deltas and wetlands, the heavy dependence they promoted on artificial fertilizers, pesticides, herbicides, and monoculture farming, the trapping of soil-replenishing silt, the destruction of river wildlife—the Columbia River’s 15 million wild salmon fishery had collapsed to under 2 million because the fish couldn’t surmount the dams to return to their spawning grounds, for instance. By the late twentieth century, the main discussion about dams was their decommissioning and removal—indeed, in the United States decommissioning surpassed new construction by 2000. America’s antidam campaign had gained impetus from the vibrant, grassroots environmentalist movement that had sprung up in reaction to the mounting evidence that mankind was inadvertently poisoning itself with the detritus of industrial growth. Just as the large urban concentrations of the early nineteenth-century Industrial Revolution created foul sanitary conditions that threatened the habitability of large cities and produced the sanitary awakening, rapid industrialization produced unwholesome accumulations of unwanted industrial and agribusiness pollution of society’s public waters, air, and soils that was midwife to the modern environmental movement. Over the decades surface freshwater rivers and lakes, seacoasts, and slow-moving, unseen groundwater ecosystems had grown increasingly contaminated. By the mid-twentieth century a new phenomenon—water pollution on a scale and intensity that overwhelmed natural ecosystems’ restorative capacities—began to visibly threaten both public health and the long-term environmental sustainability of unfettered economic growth. Before World War II, the overwhelming proportion of pollution emanated from the smokestack technology cluster that burned fossil fuels and produced heavy metals like iron and steel. After World War II hundreds of new plastics, agricultural fertilizers and other synthetic chemicals—many extremely toxic and difficult for natural forces to degrade—became increasingly major pollutants. For decades chemical companies dumped untreated toxic wastes into local rivers, ponds, and streams, where they leached into groundwater drinking sources and years later brought illness and death to uncounted thousands. By 1980 the United States had more than 50,000 toxic waste dumps. In one infamous incident, residents and schoolchildren in Love Canal, a neighborhood in Niagara Falls, New York, built on landfill atop a toxic waste dump site, suffered abnormally high rates of cancers and birth defects a generation later. The area was declared a disaster zone and evacuated. Similar horror stories emerged in other countries. Japanese children around Minamata Bay, for instance, showed brain damage after 1956 from eating fish contaminated by the mercury dumped years earlier by a local chemical factory. Islands of toxic waste as long as 18 miles long and three miles wide formed in the Soviet Union over one-mile-deep Lake Baikal, the world’s largest freshwater lake. North America’s Great Lakes, holding about 20 percent of Earth’s fresh surface water, also showed the pollution from the heavy industrial activity around its shores; by the early 1960s much of Lake Erie’s fish life had suffocated due to algae blooms run amok from fertilizer runoff and dumping of wastes. Similarly, a large part of the once rich Baltic Sea fishery had become biologically dead from northern Europe’s heavy industrial sewage and chemical fertilizer effluents, above all those drained by communist Poland’s filthy Vistula River. Acid rain caused by rising sulfur dioxide emissions from industrial smelters and burning fossil fuels contaminated freshwater sources and food chains across national boundaries; the sulfur dioxide emitted in a single decade in the late 1980s from Ontario’s giant copper and nickel smelters alone was estimated to have exceeded the entire volume released naturally by all the volcanoes in Earth’s history. Nuclear weapons production by the Cold War superpowers also polluted rivers and lakes in America and the U.S.S.R. with deadly radioactive waste. The publication of Silent Spring immediately gave voice to the inchoate, gathering public concern about the environment. Almost overnight, the modern environmentalist movement became a potent political force. Big chemical companies, the U.S. Department of Agriculture and others with perceived vested interests in maintaining the short-term status quo, like their counterparts in all eras, mounted a vigorous offensive against Silent Spring. Carson’s science, her professional credentials, and even her personal traits were assailed. Yet Silent Spring resonated deeply within countervailing constituencies of America’s pluralistic democracy. President John F. Kennedy took a personal interest. Several expert federal and state studies were duly undertaken and corroborated her allegations. Before the decade was out, the new environmental movement had gathered unstoppable momentum. Action was further galvanized by a number of high-profile environmental disasters. None was more influential than the spectacular, five story high flames that combusted on Cleveland’s Cuyahoga River on June 22, 1969, from the sheets of unregulated, flammable wastes that had been dumped into the river. Within months, the United States took the regulatory lead by enacting comprehensive national environmental legislation and empowering the Environmental Protection Agency to execute it. The 1972 Clean Water Act, and the 1974 Safe Drinking Water Act, were passed to cleanse America’s surface and ground waters of pollution. Authorities began to tackle the immense problem of controlling intensive, algae blooms in lakes and coastal seashores. Endangered species were protected. DDT and other harmful chemical pesticides were banned domestically, although not their export to third world countries. The first annual Earth Day on April 22, 1970, rallied 20 million Americans to support an environmentally healthy planet; twenty years later, 200 million people in 140 countries turned out. Environmentalism went global in the late 1980s. The United Nations played a leading role, starting with the influential 1987 report “Our Common Future,” known also as the “Brundtland Report” after its Norwegian chairwoman, that called for examining the relationship between economic growth and environmental sustainability. Thereafter it supported Earth Summits of heads of state every decade since 1992, an ongoing intergovernmental study of climate change from 1988, an influential commission on environmentally sustainable development in 1989, and the first comprehensive, five-year-long assessment of Earth’s total ecosystems inaugurated on the occasion of the millennium in 2000 and completed in 2005. International environmental treaties covering environmental problems from air pollution to global warming also were signed by many countries. From the early twenty-first century, water ecosystems received special attention. The U.N. published its first triennial World Water Development Report in 2003 and in 2005 launched the International Decade of Water for Life. Providing clean water and a healthy environment increasingly became a standard measure for domestic legitimacy around the world; horrendous environmental disasters helped undercut the political credibility of the Soviet Union before its collapse and were increasingly becoming focal points of democratic protests in early twenty-first-century China. Giant industrial corporations, such as General Electric, gradually embraced environmentalist agendas and attempted to redefine their images and activities as eco-friendly. Sadly, Rachel Carson never lived to see her handiwork come to fruition. She died of cancer in 1964, at age fifty-six, less than two years after Silent Spring’s publication. The environmental movement represented a turning point in water and world history. For all human history, the governing view was that Earth’s freshwater resources were essentially unlimited, naturally self-cleansing, and free to extract from its ecosystem without consequences in any amount of which man was capable. In its place, increasingly, a new recognition was emerging: that in order for industrial civilization, with its prodigious power to alter the natural environment, to continue to thrive it was necessary to establish a sustainable equilibrium between economic growth and its host water ecosystems. America’s pioneering giant, multipurpose dams were the instant envy of the world. Within only a few decades, foreign states everywhere were striving to replicate America’s achievement. The result was a dam-building boom of epic proportions on virtually every major river of the planet. The resulting improvements in material well-being helped make communist states credible challengers to the postwar hegemony of liberal Western democracies, and allowed newly independent, poor countries, for the first time in history, to move up the industrial development ladder. Industrialized prosperity spread globally, transforming the world political economy and balances of power. By the end of the century, it had helped bring into existence a multiaxial, interdependent global order that was gradually superseding the long era of western European and U.S. hegemony. For all countries, the cheap hydroelectricity and freshwater unlocked by large dams was a panacea—irrigation for increased food production, power for industrial factories, healthy drinking water, sanitation services and illumination for large metropolitan centers, and popular hope of betterment in material life. Dams transcended political or economic ideology. Whatever the system, dams meant prosperity, more stable societies and greater governmental legitimacy. American president Herbert Hoover’s statement that “Every drop of water that runs to the sea without yielding its full commercial returns to the nation is an economic waste” was virtually interchangeable with Soviet Union leader Joseph Stalin’s maxim that “water which is allowed to enter the sea is wasted.” Every twentieth-century leader from Teddy Roosevelt to China’s Mao Zedong would have concurred. At the dedication of north India’s giant Bhakra Dam in 1963, an awestruck Prime Minister Jawaharlal Nehru echoed the rhapsodic Franklin Roosevelt at Hoover as he proudly likened the dam project to “the new temple of resurgent India.” Both his sentiment and metaphor were strikingly similar to President Nasser’s comparison of Egypt’s High Aswan Dam to a pyramid. To each and every leader, water seemed to be a potentially infinite, enriching resource of nature limited only by society’s technical virtuosity in extracting ever more of it from the environment. The centralizing, hydraulic society tendencies of dam-building conformed easily to the model of communist state planning. Marshaling an unpaid army of gulag laborers, Stalin began erecting dams on the Volga River in 1937, and thereafter built them on other great rivers including the Dnieper, Don, and Dniester. All across the huge nation, rivers were rerouted and lakes diverted to the design of Soviet water engineers and state industrial planners. With the help of giant dams, the Soviet Union increased its water use eightfold in the sixty years following the 1917 Bolshevik Revolution and rose to rival America as the world’s leading superpower. Aggressive dam construction and associated water management likewise was a centerpiece of Chairman Mao’s effort to reengineer Chinese society to communism in the postwar era. Given Chinese civilization’s storied heritage of heroic state waterworks, China’s communist mandarins took naturally to the opportunities of dam building on all its rivers, great and small. By the end of the twentieth century, China had some 22,000 large dams—nearly half the world’s total and more than three times as many as America—helping to more than double irrigated cropland in the first quarter century of communist rule from 1949. In 2006 it officially opened the world colossus of all dams at Three Gorges on the Yangtze—China’s Hoover, and linchpin of its bid for an accelerated economic transformation akin to America’s conquest of its western arid lands. Japan’s postwar economic miracle—and the largesse that kept the ruling liberal democratic party in power for so long—rested in part on the intensive exploitation of its limited arable land and its hydropower potential through the construction some 2,700 large dams on its mountain-fed rivers. India’s 4,300 large dams ranked it third in the world behind China and America and were vital to its keeping pace in food production for its explosively growing postwar population. Almost every developing nation had its signature giant dam project that was the political and economic centerpiece of its society. As the Aswan Dam transformed the Nile, and with it, all Egypt, Turkey’s giant, 1990 Ataturk Dam anchored its immense, region-transforming Southeastern Anatolia Project of 22 dams and 19 hydroelectric plants, while downstream on the Euphrates, the national dreams of Syria and Iraq hinged on there being enough water for their own giant dams. Pakistan’s national pride was the huge Tarbela Dam on the Indus. Water-rich South America’s stupendous, 1991 Itaipu Dam, on the Parana River on the Brazil-Paraguay border, held the title as the world’s largest generator of hydroelectricity—at least until Three Gorges hit full capacity. Central Asia’s Tajikistan inherited the world’s tallest dam, the Nurek, at 984 feet, when the old Soviet Union broke up. In all, by the end of the twentieth century mankind had built some 45,000 large dams; during the global peak of dam building in the 1960s, 1970s, and 1980s, some 13 were being erected on average every day. World reservoir capacity quadrupled between 1960 and 2000, so that some three to six times more water than existed in all rivers was stored behind giant dams. World hydropower output doubled, food production multiplied two and half times, and overall economic production grew sixfold. The international dam boom facilitated one of the most dramatic physical man-made transformations of Earth—the rapid expansion of irrigated cropland, much of it far from natural riverbeds, often through the ferocious conversion of forests and wetlands. Abetted by the extensive mechanization of agriculture, irrigation nearly tripled in the half century after 1950 to cover about 17 percent of the world’s arable land and produce 40 percent of its food. Intensified application of water was a critical linchpin of the world-changing, twentieth-century Green Revolution, which spread from the West to produce surplus yields across the developing world from the 1960s and 1970s. The Green Revolution was based on breeding high-yielding strains of staple crops like corn, wheat, and rice that were highly responsive to intensive inputs of water and chemical fertilizer. One of the pioneering breakthroughs had been in hybrid American corn, starting in the 1930s. By the 1970s, virtually all the corn grown in the United States was hybrid, with yields averaging three to four times more than standard corn of the 1920s. Hybrid dwarf wheat, which carried many more grain seeds in its head than ordinary wheat, triggered its first Green Revolution in Mexico, then spread with spectacular results in the 1960s through the wheat belts of southwest Asia from India’s Punjab to Turkey at the head of the ancient Fertile Crescent. Regularly at the brink of mass starvation, staved off only by massive American food donations, India became self-sufficient in food following its 1974 adoption of hybrid wheat. From the late 1960s, hybrid dwarf rice took hold through the world’s rice belt, from Bengal to Java to Korea. Between 1970 and 1991, hybrid varietals increased their share from under 15 percent to 75 percent of developing world wheat and rice crop, while yields multiplied by two and three times. The Green Revolution was akin to other great agricultural revolutions that transformed world history, including the arrival of Champa rice in China in the eleventh century, the introduction of American maize, potatoes, and cassavas to Europe and Asia after the European Voyages of Discovery, and Britain’s successive, systematic Agricultural Revolutions from the late seventeenth to early twentieth centuries. Instead of mass starvation and political upheaval from the twentieth century’s quadrupling of world population, world living standards per person ruptured from all historical trends and tripled. The global diffusion of wealth creation helped establish a new world economic order marked by an integrated web of fast-moving, cross-border exchanges of communications, capital, goods, ideas, people, environmental impacts as well as buffeting feedback loops. Goods moved around the world on an oceanic superhighway of intermodal container shipping to create a new phenomenon in which demand in any country could be met by supply produced outside its borders as readily as from within. By 2000, some 90 percent of world commerce moved by sea on some 46,000 giant ships amid 3,000 major ports and through a dozen strategically vital straits and sea canals. The stunning abundance of clean, cheap freshwater that became widely accessible through giant dams, motorized drills, pumps, and other advanced industrial technologies highlighted water’s indispensability in this remarkable achievement of civilization. Yet toward the end of the century, the global water cornucopia unlocked by the age of dams began to reach its limits and, as in America, peak out. A similar pattern of ecosystem depletions and limitations, yet on a much larger, planetary scale, was emerging. By 2000, some 60 percent of all larger river systems in the world passed through dams and man-made structures. Most of the best hydropower and irrigation dam sites in the world were already being used. So much freshwater had been redistributed across Earth’s landscapes in dams, reservoirs, and canals over the twentieth century as to account “for a small but measurable change in the wobble of the earth as it spins,” noted world water expert Peter Gleick. Like the Colorado, great rivers such as the Yellow, Nile, Indus, Ganges, and Euphrates no longer reached the sea much of the year, or did so carrying greatly diminished restorative water flows and sediment to their delta and coastal ecosystems. The deleterious side effects of protracted, intensive irrigation and inadequate drainage on soil pauperization through salinization, waterlogging, and silt erosion were everywhere in increasing evidence. Irrigated cropland that had provided such a spectacular growth in worldwide food production was being retired as fast as new irrigated land was developed—the historic net expansion of irrigated land had ended. As traditional surface resources ran low, more and more regions were mining groundwater for irrigation much faster than nature’s water cycle could restore it—some 10 percent of world farming was unsustainable in the long run. Water tables were sinking and desertification was spreading on several continents. Many parts of the world were compounding the problem by poisonously polluting their freshwater supplies, as well as their coastal fisheries, with industrial waste and farm runoff. At the dawn of the twenty-first century, a new water challenge was rising to the forefront to reshape world civilization, geopolitics, and governing hierarchies between and within societies—an impending famine of freshwater and the depletion of Earth’s civilization-sustaining water ecosystems. What was happening was that for the first time in history, mankind’s unquenchable thirst, whetted by voracious industrial demand, gargantuan engineering capacities, and sheer multiplication of human population and individual consumption levels, was starting to significantly outstrip many planetary ecosystems’ absolute supply of readily accessible and renewable clean, fresh liquid water. Based on current usage trends, practices, and foreseeable technologies, it was doubtful there was enough freshwater returning to the Earth’s surface in the natural water cycle of evaporation and precipitation to sustain the economic growth necessary for the developing world’s billions to attain anything close to the levels of prosperity and health enjoyed in the West—and for a terrifyingly large percentage of humanity, there wasn’t enough clean water to live healthy, natural lives at all. An explosive competition for scarce water loomed. Many of the driest, most heavily populated, and destitute regions, already couldn’t feed their populations and had little realistic hope of doing so soon. Even in parts of the world where freshwater was relatively abundant, growing shortages were triggering a new cycle in the age-old struggle to control regional water resources, and with it, new realignments of political and economic power. The new era of freshwater scarcity was the by-product of the classic historical cycle of resource intensification, population boom, resource depletion, and flattening or falling economic growth until the next round of intensification and growth increased accessible water supply and made more productive uses of existing, available water resources. In the twentieth century, populations had multiplied based partly on the one-time surge in water supply from the era’s great hydraulic innovations. But now that water supply boom was peaking out, leaving behind populations in many parts of the world with greater material needs and expectations than resources to satisfy them. With human population projected to balloon 50 percent by midcentury, the second scissors blade was now ineluctably closing. The planet’s supply of accessible freshwater, as presently managed, was insufficient to meet the demands of many of the world’s mostly young, restive, and growing multitudes. Fresh, clean—and utterly indispensable—water, in short, was fast becoming a depleted global natural resource and the world’s most explosive political economic problem.